Underwater photographers have a lot going against them: water absorbs light, resulting in a loss of color the deeper they dive; and, it creates a refractive index difference that warps the photographer’s ability to gauge size and distance. And on top of that, water whisks away contrast and creates shadows on subjects resulting in blurry images. All of these issues are why photographers need a quality, bright and versatile dive light. The best on the market balance out the light in even the darkest spaces, allowing photographers to capture images in real-life color instead of shades of blue and gray. They also eliminate shadows and flood subjects with light, allowing for crisp, clear images. There are plenty of dive lights on the market geared toward photographers, but the absolute best dive light for underwater photography is the V3 Nemo Flood Light. This commercial dive light is the brightest dive light in the world, yet still gives photographers plenty of ways to adjust brightness levels to account for murky water, dark spaces and ambient lighting. At full power, it emits 15,000 lumens. 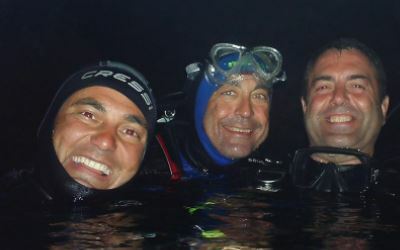 Yet with a few quick adjustments, divers can dim the light to 20%, 40%, 60% or 80% power. But brightness isn’t everything when snapping photos underwater: color balance and UV capabilities are essential. The V3 utilizes 18 Cree LEDs and 10 UV LEDs to create multiple different modes: wide angle white floodlight, UV light, white floodlight and UV floodlight. This level of versatility ensures that divers can capture the vivid colors of coral, the depths of caves and everything in between. In addition to its lighting capabilities, the V3 was designed to be exceptionally easy to handle and use. At just 800g/1.7lbs, it’s incredibly lightweight. Add in the multiple mounting options, including a GoPro bracket and ball mount, and the exceptional 60-minute burn time at the highest setting, and it’s a breeze to dive with, even in tight conditions. The V3 Nemo Flood Light is also designed to allow divers to swap out batteries underwater, so photographers will never have to miss an amazing shot just because their light is starting to dim. It’s difficult to find a photography dive light that delivers on all fronts, but the V3 Nemo Flood Light absolutely eliminates the need for another dive light. Which is exactly why it’s the best dive light for underwater photography.